As of 1 January 2018 Bob van der Linde is the new city carillonneur of Arnhem. Four of the twelve applicants were invited by the Eusebius Arnhem Foundation for an audition that took place on Wednesday, November 15th. 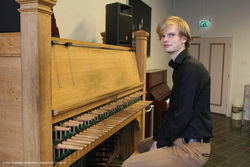 This was judged by a jury consisting of Frank Deleu, former city carillonneur of Brugge, Thom Koldenhof, former dicrector of Artez (conservatorium Arnhem) and Gert Oldenbeuving, former city carillonneur of Nijmegen and Zutphen. Bob’s musical qualities were very convincing and also because of his ambitions as carillonneur the jury decided to nominate him. It has never been otherwise: in times of war bells were requisitioned and turned into armaments. Besides, bell bronze is suitable for casting cannons. 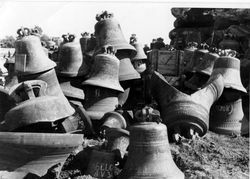 During the Second World War, in the years 1942/43, some 6700 swinging and carillon bells were removed from the Dutch towers and taken away by the German occupiers. Approximately 4,800 of them were actually melted down. <Twenty two carillons disappeared without trace.> Everyone knows stories from their surrounding neighbourhood. 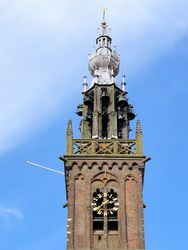 On Saturday 25 November 2017 at 2 pm, not only will a new baton keyboard be put to use, but also the five new bells in the Carillon Tower in Edam will also sound officially for the first time. The carillon of Edam previously consisted of 37 bells, 4 by Peter I van den Gheyn (cast in1561) and 33 by Petit & Fritsen (cast in 1970). 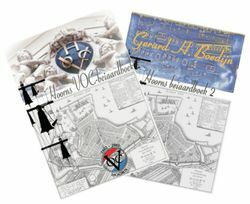 New in our webshop: the Hoornse Carillon Books. Available in both printed and digital (pdf) editions.